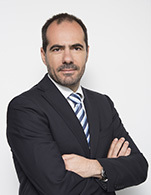 Andreas Hadjipetrou is the Managing Director of Columbia Shipmanagement Ltd, with more than 20 years of experience within the organization. He has held various positions within the Cyprus office, as well as spending 7 years in Columbia's Hamburg office as Finance Director. Mr. Hadjipetrou is a member of the board of Columbia Marlow Holdings primarily responsible for Group Marketing, Business development, Cruise vessel management and Procurment. Mr. Hadjipetrou is UK educated holding a BSc in Economics from the University College London and an MBA in Total Quality Management.